The months leading up to the birth of a child are filed with joy, dreams, plans&#8212;and a few worries. As a caring parent, you want to start your child out in life on the proper foundation. But where do you go for the answers to such questions as: How do I communicate with an infant who doesn't understand words? How can I effectively teach boundaries to my toddler? Should I ever spank my child? 1. Don't hit your kids. 2. Don't waste your time reading this book. What IS it with children's books? Millions are sold every year. Yet the vast majority are just the detailed opinions of individuals. Sure, these individuals have fancy degrees. But where is their data? Can they support their claims that parenting by their techniques does more good than harm? Are there longitudinal studies of any kind? Of course not. Don't waste your time and money reading this woman's opinions. This book is an easy read and you can take it in in small pieces (ideal for busy parents). Examples from life are helpful models of dos and don'ts and I wish the book contained even more of those. 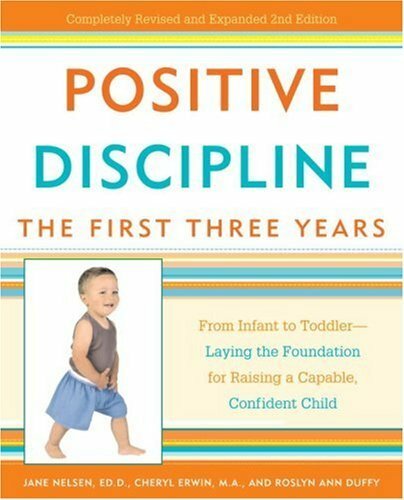 Some of the strategies presented seem a little simplistic, but at the very least the book makes you reconsider your parenting style and become more aware of how you interact with your child. It also helps you understand where your child may be coming from and what her needs are at a particular moment. At the core, it contains some useful strategies on how to deal with a challenging child or challenging situations, but you have to dig to find them. The book is quite repetitive and wordy and the authors keep deferring key points. I was a little turned off by the authors' assumption that most parents yell at and spank their children and that their book was offering a revolutionary new method of raising your child. Yet, I do appreciate their acknowledgment of our humanity as parents and their emphasis on parental love; they present mistakes as "opportunities to learn" and to improve on ourselves. Every parent should read this book! This is one of my new favorite parenting books. The authors do a great job of teaching readers how to have a mutually respectful relationship with their children that promotes cooperation. They give great communication tips and reasonable suggestions to help parents talk to their kids. They help parents understand child development so they can avoid putting their children in situations they are not ready for which leads to melt downs. They promote consistency which is so important with children. I will be recommending this book to all the parents I see in my psychotherapy practice. Don't Listen to the Negative Reviews! So many opportunities to TEACH your child! Much more than discipline!! This book was such a pleasure to read! I was engrossed and amazed at the many, many opportunities pointed out where you can take a tanrum or fit and turn it into a lesson learned for the child. This book reminds us that raising kids takes work, patience, and conistency -- I say reminds because we all know those things are true. But to take a typical situation that is unpleasant or even embarrassing to the parent and turn it into an opportunity for the child to learn something -- now that's what raising a confident and independent child is all about! Letting them make decisions early on (criteria being that there are only 2 choices and both are to the parent's approvel) sets them up for a successful outcome while allowing them to learn important decision-making skills. I learned so much from this book, but mostly that you have to look at the situation and see what the opportunity is for the child to LEARN something here. Instead of saying "no whining," allow the child to discover for himself how to fix the situation (example given was child whining about not liking the cup his mom gave him and she helped him learn that he can get his favorite cup from the cupboard and pour the juice into his new glass -- while making a mess, but still learning to make a positive change happen). Many more examples given such as what to do during a tantrum, when child is getting into something he shouldn't, and how to even handle other parents when your child "misbehaves." I thought this might be a good book so I checked it out from the library. By chapter 4 I was really turned off from reading further. In chapter 4 two anecdotes are cited of parents who want to provide early education for their infant and hope to teach their young child many things earlier than is average. The chapter goes on to briefly explain what research has shown about baby's vast brain growth and its later decline. Despite touching on this amazing subject, the chapter ends up denigrating early infant education and does so without any reference to studies, statistics, or research. I could not find any reference or footnotes to substantiate the book's position against infant education. I am still curious as to the source of such information put forth in the book. I am afraid it was very irresponsible and may be miseducating parents seeking the best methods for their children without providing some powerful research to back up the claims put forth in the book. The rest of the book had a few good insights, but for parents who don't abuse their children it basically gave the go-ahead to just continue what you've been doing all along. Changing the way you think about "discipline"